Artastic is a street spectacle, entertainment and arts education company that has transformed urban landscapes with their colourful and entertaining creations across Ireland. When possible we intend to blog about our events past and present. So have a read or simply get in touch to see how we can help give your festival or event the attention it deserves. Artastic provide entertainment that will leave you hanging on the edge of your thoughts! In 2016 Artastic collaborated with a group of young people from inner city Dublin to imagine how the future might be. Artastic wanted to help us celebrate ‘now’ by creating a ‘Wow O Clock’. This clock is designed to celebrate those times that we decide to do more of what we love. wanting to capture the attention of modern day children. Brilliant – Chapter 3, By Rody Doyle. 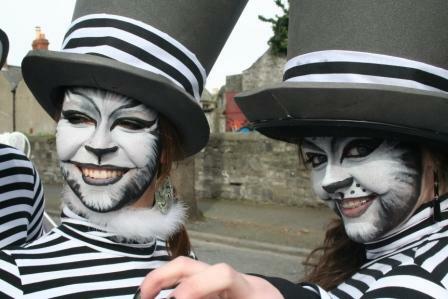 St Patrick parade 2011 -Read about how Artastic interrupted Rodys story. A photograph of this paagent won the best photograph of the festival and has feature on worldwide adverts for visiting Ireland. How does the rainbow work. Well learn the science behind how the rainbow is formed in another colourful creation of carnival arts by Artastic. The Artastic Artists imagined if they could go back through or history books, how they might add a bit of colour and carnival to some of our history. This created for St Patrick’s festival parade in 2014. Follow Artastic on a journey through the extraordinary wonders of “A topsy turvey world” where nothing is quite as it seems and strangely magical characters are simply the ‘norm’.